Perfect for matching existing contemporary or casual décor. Product Description Stylish Nook. If you want to add fashion-forward décor to your plate, then the Alcove counter-height dining collection is for you! Built at a chic counter height, this dining collection brings a hip bistro feel right into your home. With its combination of wood, metal and glass, and a cool crossover base, the eye-catching round table shows that you're style savvy. The Parsons-style side chairs, enhanced by versatile gray microfiber, create a comfortable setting, and a merlot wood finish on the table and chair legs completes the strikingly modern look. Unique Features: Classic Parsons-style chair design features easy-to-maintain microfiber with a soft-as-suede feel. The table's lower, wood shelf provides extra storage or display space. The smartly designed table showcases the perfect marriage of glass, wood and metal, blending to create a contemporary style. 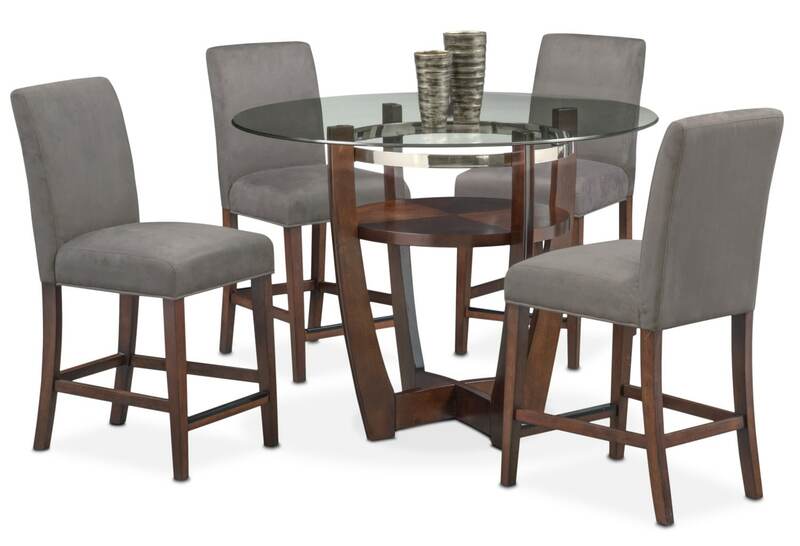 Today's popular counter-height stance is ideal for casual meals, game night or a cocktail party. The clear glass tabletop gives an unobstructed view to the mirror-finished ring detail and quarter-cut decorative veneers on the lower display shelf. Construction: Solid wood stool legs provide stable, secure seating. Durably constructed of rubberwood solids, the table features decorative veneers. Care Instructions: Use a slightly damp cloth with a mild detergent to clean on a regular basis, then use a clean, soft cloth to wipe dry and polish. Springs: Seats feature spring supports for added comfort.